Preheat oven to 200° C. Line large baking tray with baking paper and set aside. Put cut sweet potatoes into a large bowl. 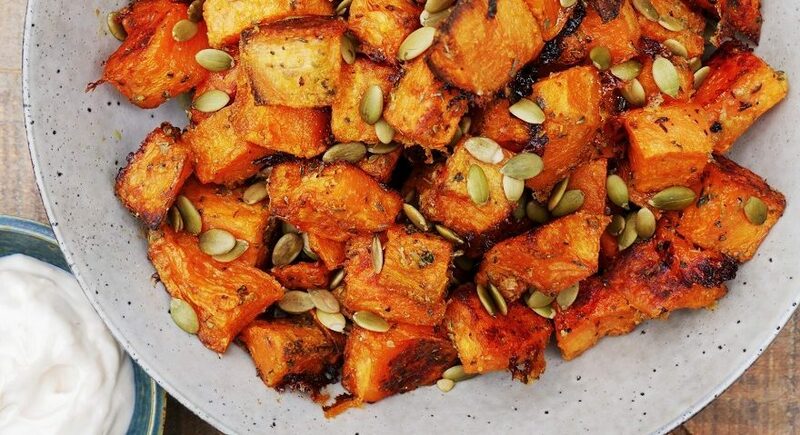 Add rest of ingredients (except the aoli and pumpkin seeds) to the bowl and mix well ensuring the sweet potato is fully coated. Spread sweet potatoes evenly onto prepared baking dish. Place in the oven for 35 mins. Once golden brown and crunchy remove from the oven. Allow to sit for a couple of minutes. Add to a bowl, sprinkle with pumpkin seeds and serve with aioli.